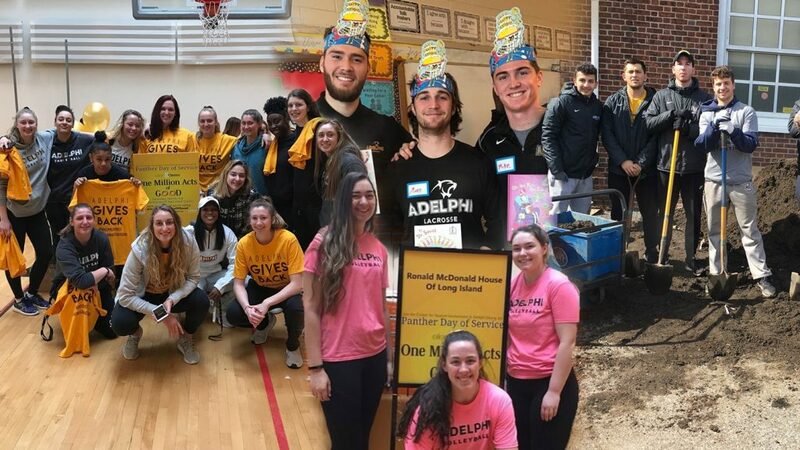 They all play different sports, but for 48 hours to begin the month of March, the name of the game for dozens of Adelphi University student-athletes was the same: community service. On Friday, March 2, members of the men’s soccer, men’s lacrosse, men’s and women’s swimming, field hockey and women’s basketball were among the athletes who headed to Front Street Elementary School in Hempstead to celebrate Read Across America Day, an annual, national initiative that promotes literacy in schools in conjunction with the birthday of famed children’s author, Dr. Seuss. The next day, several of Adelphi’s teams also participated in the university’s annual Panther Day of Service, which is offered twice each academic year by the university in collaboration with the Center for Student Involvement. Read Across American Day is organized by the Adelphi student-athlete advisory committee in partnership with Hempstead schools, and the Panthers took turns reading to the schoolchildren over the course of morning and afternoon sessions. Saturday’s Panther Day of Service affords Adelphi students, faculty and staff several opportunities to volunteer with local organizations and give back to local communities around the university. A pair of women’s teams split their time on campus and off on Saturday, as volleyball players volunteered at a Freeport animal shelter and made care packages to be delivered to children at the Roland McDonald House in Hempstead. The women’s basketball team helped out at Momma’s House, a residence for teenage mothers and their children in Wantagh, coordinating various activities for the children and parents; and at the African American Museum of Nassau County in Hempstead, polishing statues and organizing collections. Both teams also collected donations from local for the university’s annual Relay for Life event, which is scheduled to take place on April 6 to benefit the American Cancer Society. “Getting a chance to go out and participate in community service is one of my favorite parts of being both a student and an athlete at Adelphi,” said junior volleyball player and student-athlete advisory committee representative Madison Canestrari. Elsewhere, the men’s soccer team returned to Hempstead to the Barack Obama and Front Street Elementary Schools to build and set up community gardens on Saturday, after reading over 15 books to six different classrooms over the course of Friday’s school day. The men’s soccer program was the third Adelphi athletics team to collaborate with Garden Vines in community service this academic year. In the fall, the men’s lacrosse program also worked in building a community garden in Hempstead schools, and the team later partnered with the field hockey team for a winter clothing drive which collected over 200 coats as well as gloves, hats, boots and scarves. “I am once again so impressed by the commitment our student-athletes have to volunteering in the community,” said student-athlete advisory committee co-coordinator and men’s lacrosse head coach Gordon Purdie. Adelphi University joined the Northeast-10 Conference in the fall of 2009, and in the past eight seasons, has collected 25 regular season conference titles, 26 tournament championships, 33 individual crowns and captured the Northeast-10 Presidents’ Cup four times (2013, 2014, 2016 and 2017), while winning six NCAA Division II National Championships.